The deets: F21 jacket; J.Crew factory blouse; GAP jeans; Wet Seal necklace; Boutique 9 heels (sold out); Elizabeth and James sunnies; Piperlime clutch (old). I know, I know. It's basically a faux-pas to wear the bubble necklace after it blew up, went totally out of control popular, and everyone and their mom started wearing one in every color but hey, I nabbed this guy for six dollars at the Wet Seal in the mall across the street (all their accessories were half off) and still think it provides a fun way to polish up any look. I'm just not one of those girls that needs to be two steps ahead and I'm totally okay with it. I say bubble-necklace on, folks. So in love with your entire outfit!! The lipstick too is perfect! I love the bubble necklace and still want one even though they are totally on the brink of overworn. I think they are adorable! Love, love that blouse. I think that JCrew factory is doing really great with their pieces lately. LOVE the blouse and necklace - I have a yellow bubble necklace and I LOVE it!!! I say wear them, too! Haha no faux pas at all. I think bubble necklaces are really cute! It kind of annoys me that the bubble necklace disappeared just as fast as it appeared. I still like them! Maybe I'll even wear mine this week. Keep on keepin' on, girl. 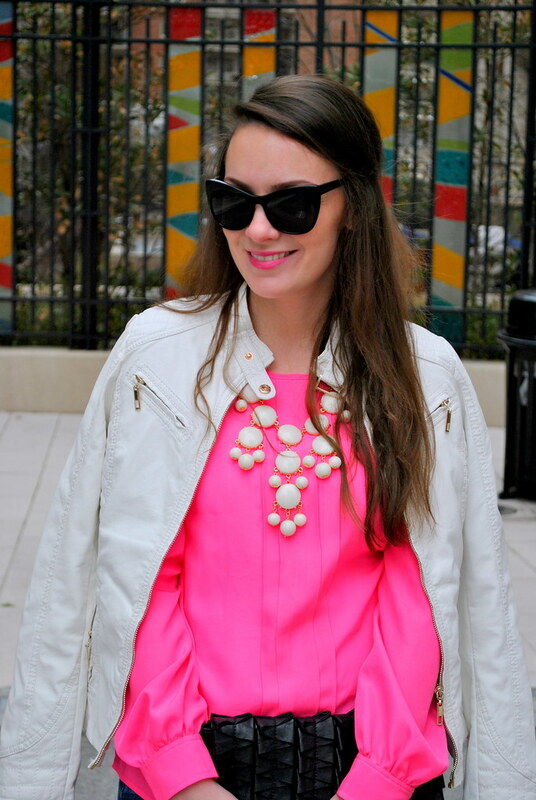 I love your jacket- I need a light-colored one for spring! You go girl!! I totally agree with you. Anyone who is not in the blogging world still goes gaga over them, and I personally thing they're adorable with everything. Great outfit! Bubble on pretty lady! Have I ever told you that I adore you in pink? Well, let the record stand, I adore you in pink! !